The Captain sat at the desk in his quarters. He held his head in his hands, fingers raked into dark blond hair. Other men his age envied such thick, luxurious hair, but they didn’t have the technological advances of Starfleet at their disposal. 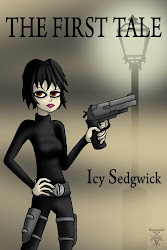 The doors slid open with a hiss and a familiar figure strode into the room. The lights adjusted their hue to better display the blue of his uniform. 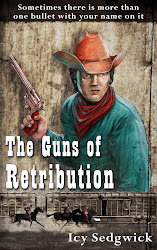 He stood to an awkward attention near the desk, troubled by the stiffness in his hip. “And here you find me.” The Captain looked up, brushing his hair back into place. The newcomer raised a pointed eyebrow. The Captain sat up and pushed his chair away from his desk. He gestured to the screen, and the science officer peered at the documentation on display. “Yes. You see, Spock, it looks like boldly going where no man has gone before is an expensive enterprise,” replied the Captain. He snorted. The Captain leaned forward and swiped his finger across the screen. His signature appeared at the bottom of the authorisation order for payment of the requested child maintenance. He gazed at his name. James Tiberius Kirk…father of at least nine declared offspring. “Hell, maybe I can start a new Starfleet of my own,” said the Captain. 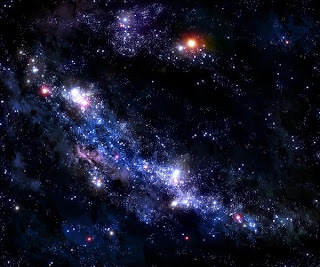 Image is Starfield by AlphaSpace. I came across this post on The Guardian and I have to admit, it's hard to believe that the Harry Potter series is fifteen years old. The Philosopher's Stone was published way back in 1997, although I didn't get around to reading it until 2001, by which point JK Rowling was already onto The Goblet of Fire. I remember buying TPS in one of HMV's two for £10 offers, along with, of all things, The Exorcist. I took it on holiday to Spain with me - that holiday saw me read The Graduate in a week, and The Exorcist in two days (I always did like to vary my reading material). As it happened, I didn't like TPS at first. I found it difficult to get into. But I tried again when I returned home and found I enjoyed it - so much so that I whizzed through The Chamber of Secrets in a day and a half, and the following two books in quick succession. I was extremely disappointed by The Order of the Phoenix, and I trudged through The Half Blood Prince. By this point, I think I'd forgotten a lot of the details that comprised the story arcs, and I was so bored by the tedious teen romance subplots that I didn't even finish The Deathly Hallows. Still, credit where credit is due - Rowling should be recognised as a master world builder, and she's truly created an awe-inspiring universe. She's gotten kids interested in reading, pissed off Church leaders (always a plus - come on, there's plenty of magic in the Bible, so why not in fiction? ), she's a successful female author and she's introduced the world to the boy wonder that is Daniel Radcliffe. I tip my extravagant Cavalier hat to you, Ms Rowling. You've been a real inspiration. What about you? 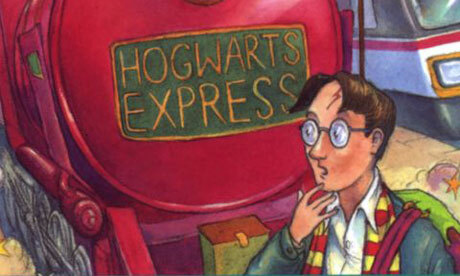 What was your favourite Potter adventure? 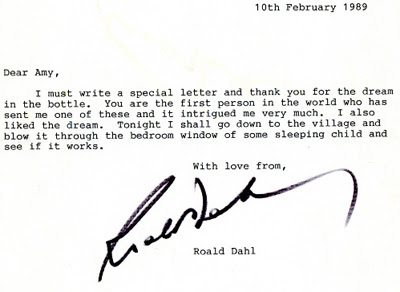 Tweet If you ever needed proof that Roald Dahl was a total dude, here it is. In 1989, a seven-year-old named Amy wrote to the author to send him a present - in this case, a bottle containing a mixture of oil, coloured water and glitter; in other words, one of her dreams. Dahl could have totally ignored the reference to The BFG, but he didn't, he chose to send back this charming letter. You can now find Amy on Twitter here. Dahl, you were a true dude, sir. Letter courtesy of Letters of Note. 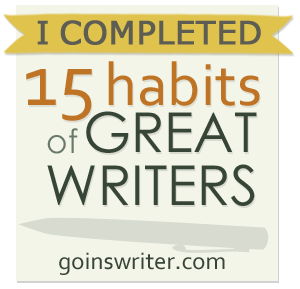 And so we come to the end of the 15 Habits of Great Writers series that I've been following. This is my final update, and general review of the series. Day Twelve (Wednesday) was all about provocation, and Jeff's challenge was to "Write something provocative and stand by it. ... Write something bold, something that moves us. Then share it." I decided against that for two reasons. Having spent my academic career studying both art and film, art which is made intentionally provocative often falls flat because it a) devotes more attention to its theme or purpose than it does to its actually construction, and b) it can be so blinkered in its mission to provoke a reaction that it fails to consider viewpoints other than its own. Jeff seemed to think that it would be somehow liberating, both for ourselves and others, to "tell the truth", but I can't help thinking that given truth is entirely subjective, it would be better for me to be true to myself as an artist in order to tell my own truth. One of his ideas was for us to "Pick a fight with something that’s wrong with the world" and this is mine - you cannot go around banging a drum about your own personal annoyances and expect to shake people up to the extent that they come around to your way of thinking. You can shout as loud as you want, but people will become deaf to what you say. Instead, reasoned argument, based on empirical evidence and logic, is more likely to get a result. If I shout at you, you can stop listening, but if I provide a logical, structured set of reasons as to why you might want to change your mind, you're more likely to be persuaded. So no, I will not be writing something to be provocative unless it is important to the piece that it provoke. Day Thirteen (Thursday) was around the idea of publishing. As always, Jeff recommends we get off our bums and "publish something. Anything, really. Whatever you do, don’t play it safe. Go for broke. Stop hiding and start writing for real". Pretty sure this was his advice earlier in the series and I said the same thing then that I'm going to say now - I am NOT going to put something out there until I'm sure it's ready. At one point he says "That eBook you’ve been stalling to finish? It’s good enough. Put it out there". Er, no. It's advice like this that leads to writers bashing out a novella, getting their partner/mother/dog to proofread it, and then sticking it on Amazon the next day, and wondering why self-publishing gets a bad rap. Work is released when it's excellent, not just "good enough". Jesus, why am I listening to this man? Day Fourteen (Friday) was all about branding. Choose a name, choose an image, etc. etc. Again, I'm not entirely sure I agree with Jeff when he says that those people who say "Do I have to do marketing?" are actually saying their story is strong enough to stand up without promotion. Most people who shy away from marketing do so not through arrogance, but through a lack of confidence, or through simply not knowing HOW to market. I've seen writers claim they don't like shouting about their books from the rooftops when in actual fact, that's ALL they do on Twitter. Writers are writers, not marketing consultants, but these days, we do need an awareness of how marketing works - no one else is going to sell our work. However, I can't help thinking that branding is something you should start thinking about once you have work to make available...not when you're just starting out. You don't want to get distracted about how to sell your work if there is no work to sell. Day Fifteen (Monday) was about serving the writing community, with an emphasis being on giving to others, and responding to their needs by giving them something they want or need. Jeff recommended that we do give aways, conduct a survey to find out what people actually want, write about something important and then give it away, or to continue to answer all correspondence. I'm a big fan of availability, and I've been making a concerted effort of late to reply to tweets, to have conversations on Facebook, and to get discussions going on my blog. This isn't all about me - this is about dialogue, and I genuinely enjoy chatting to people. As to responding to the needs of readers, I'm hoping that people read my stuff because they enjoy it, in which case I'm serving their need for entertainment. Is that the case? Overall, I'm not entirely sure that the series has been overly helpful to me. All it's really done is say "Yes, you're on the right track, keep doing what you're doing." Perhaps it would help newcomers, or those writers just beginning to test their wings, although I'd still urge caution when it comes to sharing work, especially on Amazon etc. Put out a quality product...and you can't really go wrong. The 91st prompt is Piper.